Are you planning a gathering for Independence Day? Might it also include a barbecue? How about an informal, easy and inexpensive centerpiece? 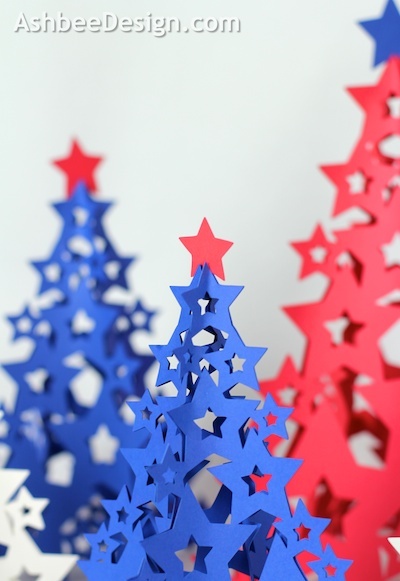 I applied the same idea I used for a Valentine Tree in February to a tree of Stars for the patriotic holidays. This is a simple cutting file for the Silhouette that I designed. It is available in the Silhouette online store here. 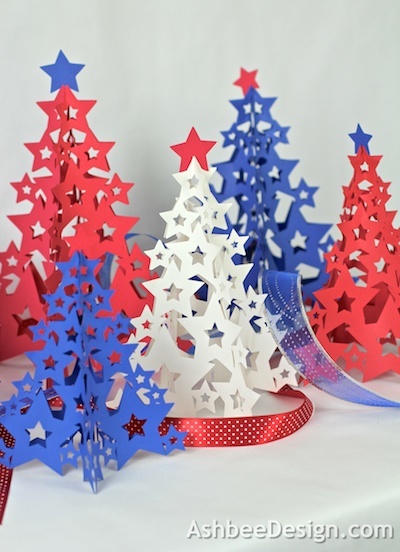 Basically, you cut the tree pattern four times from ordinary card stock and then glue the tips together. 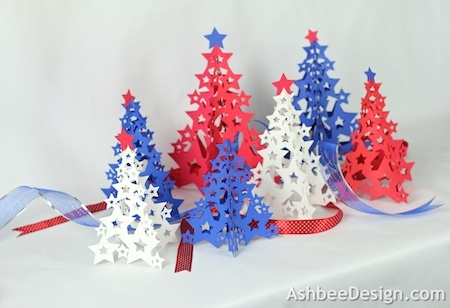 I have posted a step-by-step tutorial on my sister site, Ashbee Design Silhouette Projects here. While you are at it be sure to make them all the colors of Old Glory. And if you make a few more you'll have enough for a celebration style centerpiece. Now all you ned is some summertime food. I am thinking about barbecue chicken, corn on the cob, fruit salad, potato salad. Yum. Lets party. But if you are planning a picnic, you'll need a creative solution for weighting these trees down. A good gust of wind and they'll be swimming in the lake. Possibly placing them over a clear drinking glass and tape them to it would work. And now stretch your imagination a little bit. Picture these trees cut from silver and black paper for New Year's Eve, or gold for a Oscar party. Even cut them out in neon colors for a pre-teen "You're a Star" birthday bash. It is a very adaptable celebration idea. If you use it, send pics! These are so fantastic. I like how you added the ribbon to the display too. Brilliant for Christmas too. This idea can be used for many different holidays. 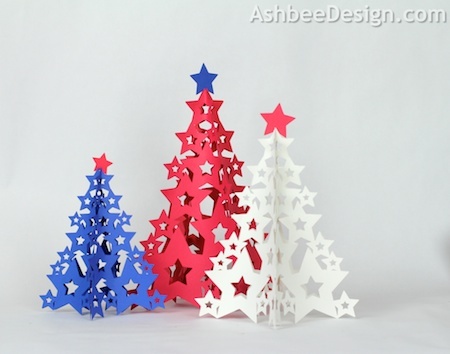 I do have a different tree design for the Christmas season which I will upload to Silhouette a little later in the year. So cute! Don't have a cutter, but this a a great idea! On my way - and checking out your pinterest boards. Some great ones for a gramma! Yes, the star is universal for so many holidays, just change up the colors. I do have other designs coming for other holidays as well. Stay tuned. Just trying to decide if it is better to get the patterns up now or wait until the month before the holiday. This looks so terrific and versatile. I can totally see using this for several holidays. Thanks for a sharing such a terrific, simple craft. Gotta get me a Silhouette! I saw these pop up on Pinterest not long ago! 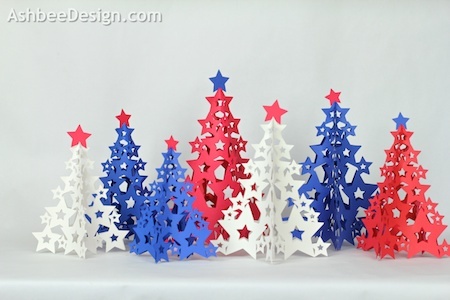 I just love little "trees" for all the holiday! Trees has always been a recurring theme for me, just check out my pinterest stuff. I have a huge board dedicated to birch, another to twigs and branches and if you look at my posts on Christmas Card design you'll see I use the tree theme over and over again. More to come for sure. This is super cool! I love that you created the file too, one day I will learn how to use my Silhouette to the best of it's abilities too!! I'd like to invite you to come link up with our party this week also! Anyone out there making these for sale? I have a person that has contacted me and would like to buy 9 sets but I don't have the time. Let me know and I'll send contact info.